The best part of skiing is that it brings you to new heights – literally. From the summit of New England’s ski areas, you can take in our incredible surroundings. Though not the Rockies, nor the Alps, the Northeast has its own wintry appeal. The proximity in our region to other “skiable” mountains makes it fun to venture from one mountain peak to the next, changing your venue as you go. The trails I have selected below represent a few of my personal favorites in New England for their fine vistas. Whether it is a view of our magnificent lakes, the vast forests or the mighty Mount Washington, (the pinnacle to all other New England summits), each of these trails are highly scenic. See also New England’s Most Difficult Ski Trails and New England’s Most Interesting Ski Trails. 1. 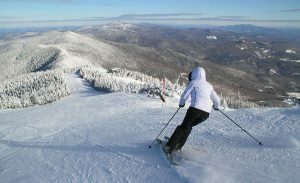 Rim Run at Sugarbush offers one of the best lookouts in the beautiful state of Vermont. From here you have an impressive view of Lake Champlain and across the water, New York ’s Adirondack range of 5,000-foot peaks. Vermont’s northern mountains, Mt. Mansfield’s Stowe, Smugglers’ Notch’s Madonna, and Camel’s Hump are perfectly framed from this trail too. 2. Flintlock at Gunstock, New Hampshire’s family mountain of the Lakes Region, is best enjoyed on a clear day. The sensation of skiing down, practically into Lake Winnipesaukee, is almost like being in Lake Tahoe (I said “almost”). With a backdrop of the White Mountains and Mount Washington – the Northeast’s crowning glory, Gunstock is a choice location. area with a perfectly framed view of “The Mount”. Of course, the Top O’Quad restaurant is another perfect locale for a great lunch overlooking Mount Washington and the grand 1902 Hotel, which has been restored beautifully. 4. Skiing Pole Cat at Wildcat in Jackson, New Hampshire gives you the sensation that you can reach out and touch Mount Washington’s eastern flank. In fact the view into Tuckerman’s Ravine is unlike any other. A sunny March day at Wildcat will bring out the shutterbug in every skier. 5. White Nitro of Sugarloaf, Maine offers an eye-popping panorama, from the 4,237-foot summit. From this northern vantage point you can see forever. This trail is so darned steep that it will also take your breath away. Tell your fellow skiers you are admiring the view, when they ask why you have stopped skiing. 6. Drifter turns the skier and rider in every angle while descending Madonna Mountain at Smugglers’ Notch, Vermont. 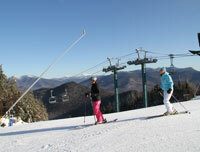 From Drifter, you can look across the Notch at Stowe’s Front Four and the impressive 4,395-foot Mount Mansfield peak. Also within visible range are Lake Champlain and the stately Adirondacks, home to the 1936 & 1980 Olympic Winter Games. 7. Vista Way is appropriately named at Cannon Mountain in New Hampshire. This is the highest lift serviced elevation in New Hampshire at 4,180-feet. From this magnificent summit, you look down into Franconia Notch and Echo Lake. The view across the Notch of the Presidential Range is definitely worth the price of admission. Claim a window in the back of the Aerial Tram as you ride up for the best panorama. 8. Willoughby at Burke Mountain overlooks the Northeast Kingdom of Vermont. Lake Willoughby sits to the north, demarcated by the dramatic slope of Mount Pisgah, playground to ice climbers from around the world. The surrounding hills are dotted with farms, so “story book Vermont”. 9. Lookout at Camden Snow Bowl in Maine is where the mountains meet the sea. Where else in the world can you view the Atlantic Ocean from a ski trail? This great little ski hill in coastal Camden makes the scenic list for that unique spectacle alone. 10. Walking Boss at Loon in New Hampshire starts out gently with gigantic views of Mount Washington off in the distance, Tecumseh and Osceola as well.